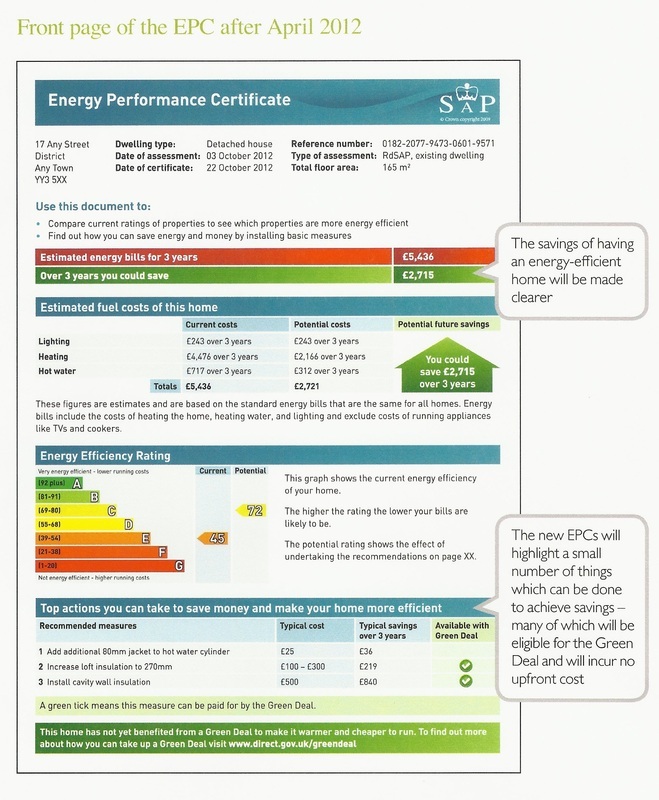 The new Energy Performance Certificates will be issued from 6th April 2012. Following market research and comsumer group studies the new EPC has been redesigned to be simpler to read and easier to understand. The revised EPC's will also contain additional information on The Green Deal, alternative measures and Renewable Heat Incentive (RHI) calculation returns. Page 1 will be the page required to be shown on sales particulars replacing the Energy Efficiency Rating rating that's used prior to April 2012. This page contains the current costs for running the property over 3 years and the potential cost savings made by installing the recommended measures featured later on in the report. The SAP Energy Rating Graph is still included, although the Envoiromental Impact (CO2) rating has moved to page 4. The England and Wales average rating has been revised and is now a Band D (rating 60). The 3 most cost effective measures are shown on the bottom of the page along with the estimated costs to install and the typical savings made over 3 years. A green tick here will indicate if the improvements are eligible for Green Deal finance. If the property already has a green charge attached with it, it will be detailed here. Page 2 contains the performance of the key elements of the property such as the walls, roof, floors and heating system and controls that have an impact on the Energy Efficiency of the property. Any details of low and zero carbon technologies are listed here. Page 3 contains the all the energy saving recommendations with indicative costs to carry out the work and the typical savings attached. Any alternative measures deemed suitable are listed here and a possible Green Deal package based on the EPC is produced. Page 4 contains the Energy Assessor and Accreditation scheme details along with the Environmental Impact rating. Any addenda notes are written here as well as any previous Green Deal charge on the property.